Paul had been arrested and taken to Rome for his second imprisonment in Rome when he wrote this second letter to Timothy. Paul was not anticipating being released from prison; in fact, his appearances in court so far had not gone well. (2 Timothy 4:6; 4:14; 4:16) Paul begins this letter reminding Timothy that Timothy had “sincere faith” (or, “genuine faith), and because of this solid foundation Paul commands Timothy to “fan into flame the gift of God” that is in him. The phrase “fan into flame” is a clear reference to rekindling the embers of a fading fire or “to kindle afresh.” Commentators agree that neither Timothy’s faith nor his spiritual gift was fading, but instead Paul was encouraging Timothy to become even more active and to energize his spiritual gift for an even greater flame and more production. It should be noted that Paul says, “I remind you…” which indicates this was not the first time Paul had taught Timothy to stay active with his gift. Paul then describes what the manifestation of Spirit of God would look like in Timothy’s life. Paul says a gift of the Spirit of God is not “timid.” The Greek word translated “timid” is deilia which basically means “cowardice.” It is actually a very strong word for the fear of a coward and is frequently used in references to soldiers' failure in battle due to fear and the terror that overtakes them. and what is falsely assumed to be “christ-like” character. Instead of being “timid” (which often is accepted as “christ-like” in church environments), Paul strings together three words: “power,” “love,” and “self-discipline.” All of these are words used to contrast "cowardly" and instead describe the manifestation of the Holy Spirit with words of authority, leadership and conviction to action. “Power” is dynamis in the Greek and is used in contrast to “timid” or “cowardice.” Instead of a fearful, timid character in battle, dynamis would refer to a character of influence that can assume authority and direct a situation in a truly Christ-like way. Western churches often have a hard time understanding the prophets and the men of the Old Testament because these men are forced into a passive image in order to fit them into the “timid” model instead of the dynamis model. Any successful minister or believer in the Bible was dynamis, and not deilia. Yet, Christians often praise the character trait of deilia, while criticizing as “un-christ-like” the character of dynamis. “Love” is agape in the Greek and is here not referring to the “love” that causes a person to actually do ministery or the desire to serve others, but in context how the ministry or service is executed. Agape is referring to the character of the person who is already doing the serving or manifesting the gift of the Spirit. The demonstration of “love” will be the power that enables the person to continue serving in spite of difficulties in the battle and agape will empower the believer to endure the failures and shortcomings of others in order to continue to serve them. “Love” in this context is how the Spirit of God will manifest his gift. Paul is telling Timothy that the manifestation of the Spirit is not “timid” but “enduring.” Timothy will not become bitter or resentful in the face of the opposition in Ephesus. “Self-Control” is sophronismos. This is a different word than is used in Galatians 5:23. This “self-control” is more about “sound mindedness" (Titus 2:2, 5). It is the character that causes the person that is manifesting the Spirit’s gift to stay focused on the mission and not be distracted by the deception, accusations, false-teachings, human emotions that come along with typical interactions with people who react positively, negatively or not at all to the gift. Timothy is to operate in power while serving in love and remain focused through self-control. "Boasting is the voice of pride in the heart of the strong. Self-pity is the voice of pride in the heart of the weak." 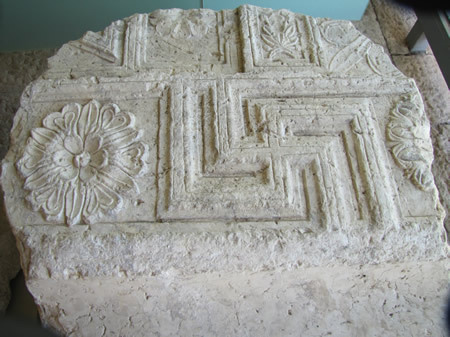 the city of Rome to Spain." is found in Romans 5:10, 1 Corinthians 7:11 and 2 Corinthians 5:18-20 (3x). Do I know what my spiritual gift is? Do I keep the flame of my gift burning? 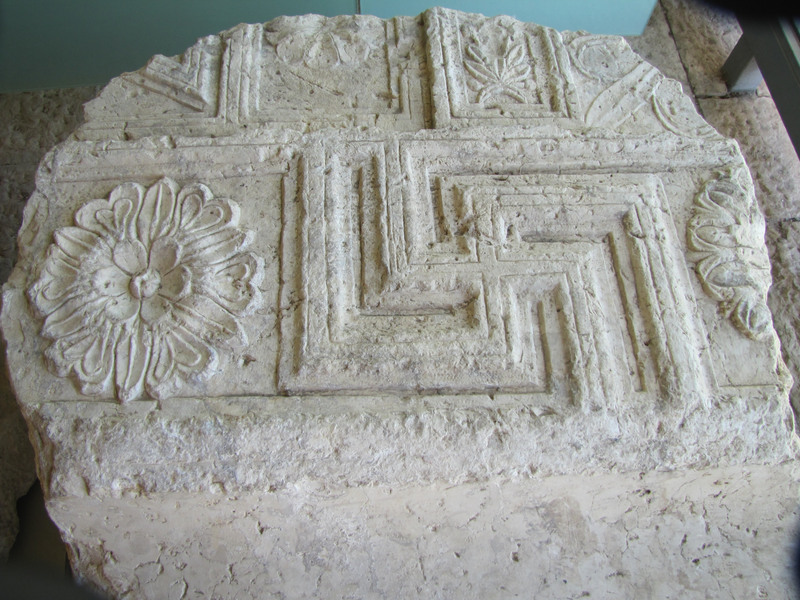 Decorative fragment from the New Testament Temple destroyed in 70 AD. 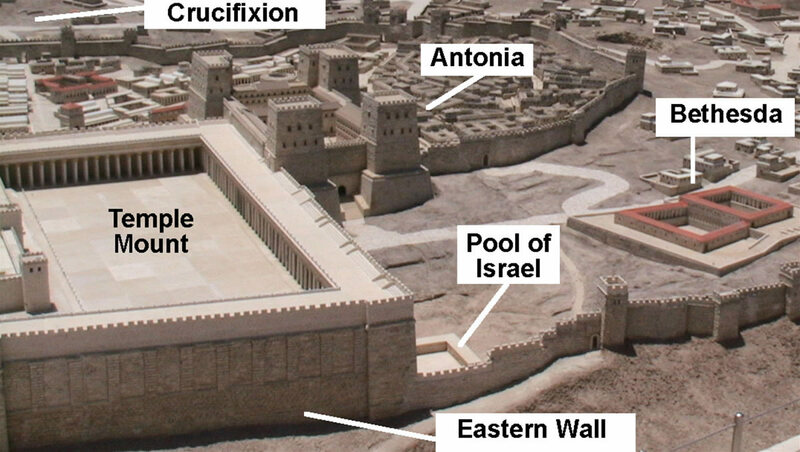 (click on image for larger size) Details of north side of the Temple Mount in 70 AD.